There are perennial lavateras that survive winter, but the annual form is killed by hard freezes. Rose, Catnip and Salvia. Locate lavatera near the edges of beds to make it easy to gather stems for indoor arrangements. 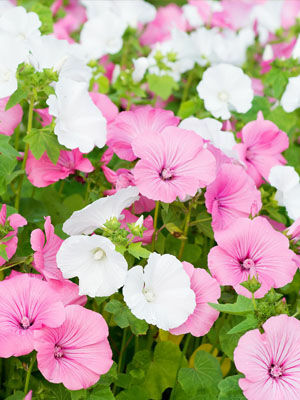 Sow large lavatera seeds where you want them to grow at about the time of your last spring frost. Or, start seeds indoors to get a head start on the season, and set them out after the last spring frost has passed. Lavatera is an annual hibiscus that attracts hummingbirds, and the newly opened blossoms make good cut flowers. Colors include soft pink and white. Gather blossoms to use as cut flowers just as they open. Snip off old flowers once a week to promote blooming time. If you allow some seedpods to ripen until they shatter, lavatera will reseed in hospitable spots. Expect some cosmetic damage from leaf-eating beetles. Where Japanese beetles are a common pest, cover plants with row cover until they come into bloom.